June 4th in Wordpress Plugins by Wordpress Jedi . We all have shared images, animated GIFs, and videos on our websites in the past. For certain projects, you may need a higher level of interactivity. Draw Attention for WordPress can help with that. It is a plugin that lets you create interactive floor plans, product views, and tutorials for your visitors. The plugin is customizable and works in modern and older browsers. Draw Attention has a responsive design. You can set up your images so different areas of each are highlighted when your visitors move their mouse over them. It is possible to display more information when a highlighted area is clicked. You can also send visitors to another URL when they click on an image map. 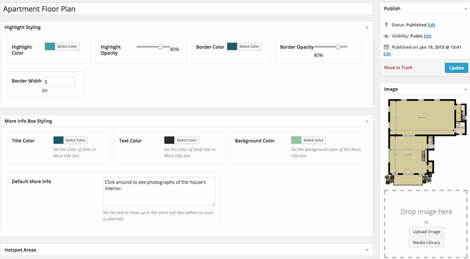 Draw Attention lets you customize colors, add additional information, and draw highlightable areas easily. This is a premium plugin.